Our first dog was a lovely Springer Spaniel called Tam. He was a wonderful family pet in many ways, but at times he showed aggression to people. This problem got me interested in dog training, and especially dog behaviour. I studied the Principles of Canine Behaviour paper at Massey University. After Tam I got two more dogs. I took in a five-year-old German Shepherd named Khan and a Rhodesian Ridgeback puppy called Kasi. I became interested in dog obedience competitions and had a go at agility while I was at it. I quickly became hooked – Khan was one of the most successful competing dogs of his time – and more than 20 years later I still compete. I have trained and owned a variety of dogs: Khan and Haidee, both German Shepherds, Kasi the Rhodesian Ridgeback, and a Labrador cross named Sascha – the first Agility Champion in the Waikato area. My current dogs are Jynx, Breeze, River and Artie. Jynx is a Rhodesian Ridgeback cross from the SPCA, Breeze a Belgian Malinois, River a Border Collie and Artie a Lowchen. I am passionate about helping owners to train and understand their dogs and all my training is done with positive training techniques based on current research and learning. 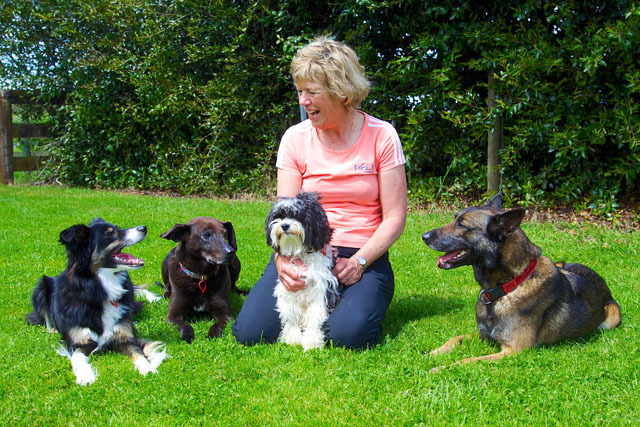 I am a Life Member of the Waikato Agility club and belong to APDT (Association of Pet Dog trainers) Australia and New Zealand and the New Zealand Kennel Club.